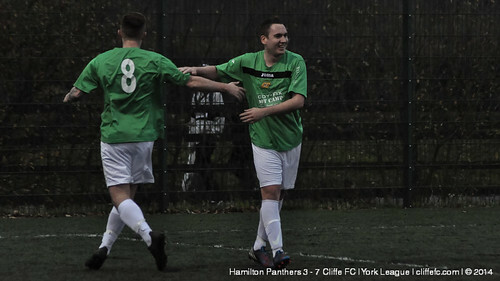 Cliffe FC win 7-3 at Hamilton Panthers, a Luke Durham hat-trick the highlight of an eventful away day – Elsewhere at Oxen Lane, Cliffe FC Reserves draw 3-3 with Rufforth United Reserves. 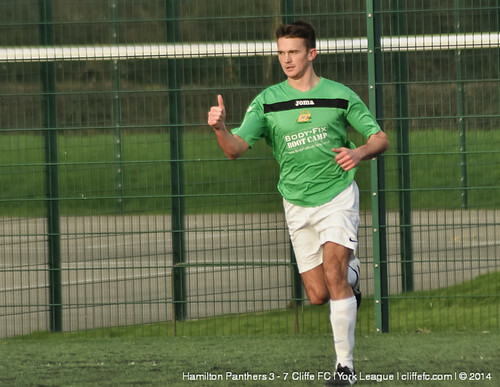 In a game where Cliffe FC needed to take all three points from the trip to Hamilton Panthers, Panthers beginning the day 3 points behind Cliffe in the Division One table. Cliffe arrived promptly to York College’s 3G and in good spirits and when kick-off arrived the away side raced out the blocks, Tom Hogg breaking past the defence and when he sat the ‘keeper down one-on-one Hogg managed to force Panthers to score an OG to open scoring after 22 seconds, 0-1. Hogg made sure with Cliffe’s second goal, breaking past the defence and drilling the ball past the ‘keeper into the bottom corner for 0-2 as Cliffe looked to go on and dominate. It soon was 0-3 when Luke Durham grabbed his first of the afternoon, breaking past his marker, picking his spot and firing the ball past the ‘keeper – 0-3. Panther stepped up their competitiveness and began to impose themselves on the game physically and this coupled with Cliffe switching off having raced into a 3-0 lead then let Panther back into the game, the score reading 2-3 minutes later. Things then became more challenging for the Cliffe ranks when they were reduced to 10-men, Jackson Lucitt ending up seeing a red card for a something the referee saw in a scuffle that followed a free-kick being awarded on the edge of Cliffe’s box. This galvanised Cliffe and they begun to dominate the proceedings once more and whilst a man down went into the break 5-2 up, Durham breaking down the left wing once more and making it 2-4 and then nice finish from Alex Hartley on his Cliffe first team debut made the score 2-5 at the half-time break, HT. The opening minutes of the second-half saw some unsavoury behaviour to say the least, it saw both sides reduced to 9-men a piece – two Panthers players deservedly red carded and Cliffe’s Andy Kirkham also seeing red for the same incident – this match report will not speculate to any specifics during the incident and the club will await the referee’s official report. The remainder of the match saw Durham complete his hat-trick with a neat finish, sending the ‘keeper the wrong way and beating him at the near post, the ‘keeper expecting a far post shot, 2-6 – a deserved hat-trick. For all his hard-work Sean Gallagher was unable to grab himself a deserved goal but absolutely worked his socks off for his team-mates. Andy Edwards got in on the act with a left-foot pile-driver from the edge of the box that flew in to make it 2-7 – Panthers solo forward broke the offside trap to score and make the final scoreline 3-7 FT.
With this win Cliffe FC move six points clear of Division One’s bottom two, and next week host Heslington on Saturday at Oxen Lane – with only three points separating the two sides. Laverack, Lucitt, Kirkham, D Jackson, Pearse, Edwards, Hartley, Taylor, Durham, Hogg, S Gallagher. Elsewhere, Cliffe FC Reserves hosted Rufforth United Reserves in a game that ended 3-3 – Cliffe’s ranks feeling they should have taken all three points after going 2-0 ahead before being clawed back and eventually settling for a draw. Cliffe’s goals came from Nick Pulleyne, Jack Brocklebank and Nigel Horner. Aaron Lees earned himself his first of two MOTMs over the weekend, Lees also getting MOTM in Cliffe FC Sundays 10-0 demolishing of Selby RSSC.